#1 UConn shook off a slow start to rout Oregon, 95-51. Not even I can believe this score: #5 Notre Dame 128, St. Francis 55. #11 Louisville 88, Tennessee State 25. #16 UCLA held off Saint Joseph's, 73-65. Forty-five games are on tap Wednesday. Chiney Ogwumike thoughtfully reflects on Stanford's loss to UConn Saturday. Morgan Tuck and Moriah Jefferson are back for the Huskies. Mercedes Russell is the top recruit in the nation. And then there were five....Bowling Green upset #15 Dayton in a 65-40 rout, handing them their first season loss. Another upset, in San Diego: Central Michigan over #20 Texas, 73-65. In the process of thrashing Monmouth, #4 Duke held them to three first-half points - undoubtedly a record for both schools. #13 Tennessee bested Rutgers for the ninth year in a row, and in the process notched the 1,200th win for the Lady Vol program. Coach Holly Warlick said she's pleased that her teaching stuck. #14 Oklahoma State took the Surf 'N Slam Classic title in San Diego with an 80-72 win over San Diego State. #16 North Carolina overcame Clemson, 65-58. #7 Kentucky upended Marist for their eleventh straight victory. #21 Florida State notched their fourth consecutive win, over Boston College, 76-70. Tulane took the title of their own tournament, 69-63 over McNeese State. Georgia Tech wrapped up the Sun and Fun Classic trophy with a 65-63 squeaker over FIU. Arizona State makes it five straight with a 60-53 win over Idaho State. North Carolina State held off St. Bonaventure, 70-66. Ole Miss squeaked out a 61-58 decision over Eastern Michigan. Illinois' Karisma Penn is ESPNW's player of the week. Coach Matt Bollant is out to turn around Illinois. Cal Coach Lindsay Gottlieb is the leader of the new school. Did anyone see #2 UConn's 61-35 annihilation of #1 Stanford coming? Stanford got harassed right off the home floor that it ruled with perfection and dominant play for nearly six years—and the Huskies surely took the Cardinal's No. 1 spot along with it. I wanted a closer game, regardless of the winner, so color me disappointed. #5 Notre Dame routed #11 Purdue, 74-47. #23 Colorado's solid win over New Mexico pushes them to 11-0. #19 South Carolina's victory over West Carolina featured five blocks from Ieasia Walker. This puts her over 200 blocks for her career. #3 Baylor racked up double digits in their 106-41 thrashing of Southeast Louisiana. #18 Oklahoma handled Cal State Northridge, 79-57. #9 Maryland whipped Hartford, 72-40. Washington State squeaked one past Gonzaga, 57-51. Louisiana Tech prevailed over Denver in double overtime, 82-77. Miami thumped Wisconsin to take their own tournament championship. Virginia also claimed their own tournament championship with a win over Xavier. Vanderbilt rang up a 74-56 win over USC. Portland State beat Portland 64-61, despite losing point guard Kate Lanz for the season. Seattle University got WAC win number one, outlasting Idaho 76-71. Santa Clara bested Fresno State, 58-53. Memphis squeaked by Missouri, 72-69. Michigan State's 57-47 win over Temple puts them at 12-1. Tomorrow's key match up will feature Rutgers at #13 Tennessee. It will be emotional for Lady Vol assistant coach Jolette Law. And then there were six undefeated teams: Illinois upset #6 Georgia, 70-59. #8 Cal is off to their best start in school history at 10-1, after beating George Washington. #7 Kentucky allowed the fewest points in school history with a 90-23 thumping of Alcorn State. Tennessee Coach Holly Warlick's good cheer had gone by the wayside. But it might return now, as the Vols routed Davidson with a new lineup. Game photo gallery. Rice's winning streak is at five after downing UTPA. Florida Gulf Coast bested LSU, 76-70. You realize, of course, that tomorrow's showdown between #1 Stanford and #2 UConn is on ESPNU, right? ODU players had a diet epiphany this year, and it's paying off. Kansas point guard Angel Goodrich is looking to inspire other Native Americans. Jazmine Adair is Siena's new director of basketball operations. You already know the Huskies are seeking revenge for the Cardinal snapping their win streak two years ago. Stanford Coach Tara VanDerveer, on being friends with UConn Coach Geno Auriemma. VanDerveer says it's basketball, not a brawl. Chiney Ogwumike and the pick-and-roll. Chiney Ogwumike and Bria Hartley are friends for life. What do you do when four of your players were injured by Dec. 6? If you're Oklahoma, two volleyball players join the team. Two sisters are trying to get Richmond University to the NCAA Tournament in their final year of eligibility. Remember, Saturday is the big showdown between #1 Stanford and #2 Connecticut. Is the rest of the Pac-12 closing in on Stanford? There's no limits for Cal's Talia Caldwell. Utah hopes to enter the Pac-12 on a high note. Notre Dame Coach Muffet McGraw is a master in a tough vocation. Oklahoma State's offense is starting to shine. Ohio State reserves are getting better with age. Deanna Nolan is vying for a spot on the Russian national team. Despite aches and pains, Northern California power house Oak Ridge is off to a hot start. Abington High is the team to beat again this year. Veteran AAU Coach Art Gregory is still reaping rewards. Makenzie White has left West Virginia to attend West Liberty State, a Division II school. A trip to China was meaningful for two Princeton players. With only one non-conference game left, Colorado is preparing for the Pac-12. They know it will be tough. Tomorrow the action begins to return, with three games. At a season ticket holder event last week, new Mystics Coach Mike Thibault revealed how he will make the team relevant in the D.C. area again. Texas A&M's Kelsey Bone is ESPNW's player of the week. Chiney Ogwumike's latest blog, on the Women's Basketball Hall of Fame. The Lady Vols are back to square one after their loss to Stanford. But they spread holiday cheer. Jen Rizzotti keeps her options open, and shuts doors when she wants to. Scheduling talk from UConn Coach Geno Auriemma. Tribute to Elena Delle Donne. Iowa players on heading home for the holidays. Miami Hurricanes focus: Macy Keen. WNBA player plans for the holidays. The league guesses what Skylar Diggins, Elena Delle Donne and Brittney Griner want for Christmas. #1 Stanford 73, #10 Tennessee 60. #4 Duke 75, USC 60. #15 Oklahoma State is now 9-0 after beating Texas-Arlington, 90-54. #25 Colorado is still unbeaten as well, after routing Utah Valley, 81-45. It is the 700th program win for the Buffs. Only a handful of teams have games today - everyone else is off on break. The shortened tournament wrapped up yesterday, and there were several California teams among the division winners. Check and see how your team ranks on three-point field goal defense. #8 Cal ran past #19 Kansas, 88-79, behind Layshia Clarendon's 28 points. #7 Kentucky's defeat of UC Santa Barbara pushes their win streak to nine. Skylar Diggins appears to be back, as she propelled #5 Notre Dame over #22 Texas A&M, 83-74. Diggins put up 24 points. It's not your usual bounce-back game for Tennessee, who host undefeated Stanford. Nell Fortner will be broadcasting from the game. The NCAA is considering making changes to recruiting rules. North Dakota Coach Travis Brewster has been suspended a game for his comments about officiating. #4 Duke 97, Cal State Bakersfield 63. My photo gallery, which includes the image below. Duke Coach Joanne P. McCallie wonders what is going on during a second-half play. Photos from last night's CSUN upset of #12 UCLA are in this gallery, and include the photo below. CSUN 77, #12 UCLA 72. Janae Sharpe guards Markel Walker, while Ashlee Guay looks on. Guay, a sophomore, lead CSUN with 28 points. Cal State Northridge upset #12 UCLA, 77-72. I was there and will post pictures later. Another upset - Duquesne beat #20 West Virginia, 62-54. Colorado is taking a cautionary approach with sophomore Jasmine Sborov, who has been having problems with her heart. USC has suspended Coach Michael Cooper for one game, today, for having an ineligible player in practice. Elena Delle Donne returned to the floor last night for Delaware, playing her first game in a month. Tennessee is staying focused. They are also optimistic about Isabelle Harrison's return in time for the Stanford game. This year, UConn Coach Geno Auriemma takes his Huskies to Coach Jen Rizzotti's house - Hartford. Stefanie Dolson and Morgan Tuck are practicing. At Iowa, every minute is cherished. Transfers are paying dividends for the Portland Vikings this season. Oklahoma wants to honor their injured teammates with tough play. Ohio State's success is tied to ball movement. Hampton's Keiara Avant thrives as an on-court leader. Michigan is off to its best start in 11 years under first-year Coach Kim Barnes Arico. UTEP is on a roll, with a 10-1 record. Purdue, 11-1, is off to their best start in a decade. Missouri has won seven straight. The Pac-12 is flexing its muscle, with four teams in the top 25. Coach Kevin Borseth is happy in his return to Green Bay. Duke's Haley Peters blogs. And I'm looking forward to having them in LA, too. Penn State's Maggie Lucas believes in giving back to the community. Iowa State freshman Emiah Bingley has landed at Florida State. Freshman forward Jonquel Jones will transfer from Clemson. Newtown, Connecticut is slowly healing....girls hoops returned last night. My young woman ended up in tears after the game. As far as I could see, she was the only one on the squad that upset. It was hard to see her like that. But then again, I took heart from it because she cares - she really, really cares. She has the game of basketball in her heart and soul. Anyone who has worked with young people over the last decade or so knows that many of them live in a sea of apathy, and they don't seem to care about much. Add to that the fact that basketball has become big stakes and a year-round job, which causes some young people to become like zombies when they play. As Stanford and South Carolina are currently playing, the list will be down to seven soon. But who will the next defeated team be????? Prior to tonight's game against Oakland, UConn had a pregame ceremony to honor the Newtown shooting victims. Former Badger Lindsay Smith has signed with Illinois State. Four coaches reflect on the recent Maggie Dixon Classic. Texas Pan-American will join the Western Athletic Conference. Mercedes Russell is doing big things. She had 38 points, 18 rebounds in a game a few days ago. Last night she had 29 points, nine rebounds and six blocks. At the Gardena (LA area) Tournament tonight, Westchester and Carson face off in a second-round match up. WHS Coach Marcel Sanders is Carson's former coach. 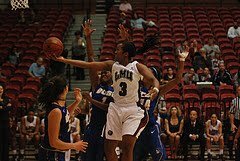 Last night Sanders' star guard, Destinee Brown, recorded a quadruple-double with 24 points, 16 steals, 12 assists and 10 rebounds. Holly Warlick and Pat Summitt are similar and different at the same time. UConn center Kiah Stokes has been sidelined by a stress reaction in her shin. She is frustrated by her latest injury. The Pac-12 is making its case nationally. Stanford has found its missing piece. UConn Coach Geno Auriemma gives his opinions on the departure of schools from the Big East. Olympics teams coaches Auriemma and Mike Krzyzewski are the USA Basketball coaches of the year. Mike Thibault is the Washington Mystics new head coach and general manager. Thibault didn't mince words today. #8 Cal outlasted Northwestern, 71-65, in a game that featured 13 lead changes. Formerly-ranked Ohio State squeaked past Gonzaga, 65-60. #3 Baylor vs. #10 Tennessee, and ESPN is already calling Baylor the winner. 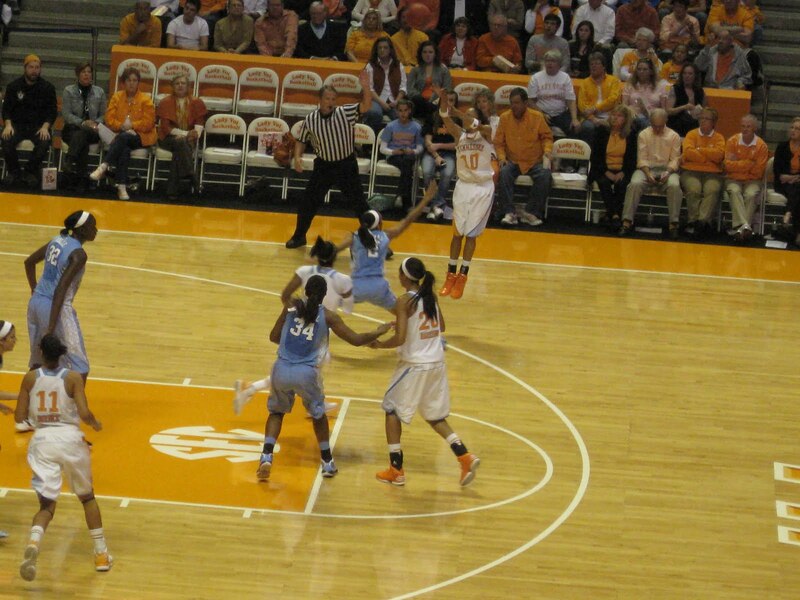 "Tenn" questions with Vol forward Cierra Burdick. Storm co-owner Lisa Brummel has been named to the Connecticut Women's Basketball Hall of Fame, as has UConn assistant Coach Chris Dailey. The former Big East commissioner said we can blame him for the recent defection of seven schools. Notre Dame's athletic director is thrown by the chaos in the Big East. ESPN writers muse on the idea of UConn going independent. Jennifer Rizzotti needs no introduction. Candace Parker blogs for the first time in a lil while. UConn will have a moment of silence prior to Wednesday's game to honor the Sandy Hook Elementary shooting victims. Players will also wear a patch. The school has created a memorial scholarship to honor the victims. Coach Geno Auriemma and his wife Kathy donated $80,000 toward the scholarship. Big big ups to Cal, Tennessee, UCLA and South Carolina for moving up, and to Colorado for moving in. Wow. ESPNW's player of the week is the Buff's Chucky Jeffery. Colorado seeks a different ending to their season this year. The Mystics will announce their new Coach/GM tomorrow. Southern fried wisdom with WNBA champion Indiana Fever Coach Lin Dunn. Maria Cornelius' name has become synonymous with the Tennessee Lady Vols. The veteran writer has been covering the team since 1998 for scout.com. She writes quality pieces, she posts video, and she takes amazing pictures. To say Maria is an expert on the subject is an understatement. It is why I interview her each fall for my Tennessee season preview. Friday, Maria found out she has breast cancer. She "spent a day in a dark room" and then said to herself, "get up and fight".....and go to Texas. She was in Austin today to cover the Lady Vol's match up with the Longhorns. Just like usual. That's the kind of woman she is. I'm asking for your help right now: whatever you believe in sending up for others, could you send some up for Maria? Prayers, thoughts, good vibrations, holding her in light - whatever your spiritual and/or religious beliefs. Creating those energy fields really works, and although Maria is very strong, she could use even more strength energy as she gets ready to fight this battle. Vanderbilt took down #12 Oklahoma, 76-63. Nebraska beat previously undefeated South Florida, 62-52. UTEP came back to hand Kansas State their first loss with a 52-50 decision. Hartford gave Quinnipiac their first defeat of the season, 67-61. Oregon held off Fresno State, 65-64, for their first win. #14 UCLA barely survived St. John's, 53-52. #11 Penn State stepped it up in the second half to slide by South Dakota State, 60-50. #22 Kansas outworked Pairie View A&M, 72-60. Niagara needed an overtime to top Colgate, 66-63. #16 Oklahoma State's 83-30 romp of Vermont means they're still unbeaten. #12 Tennessee crushed #18 Texas, 94-75. LSU rolled over Louisiana Tech, 77-55. With a whopping score of 110-47, Missouri smashed Southern Illinois for their fifth consecutive win. Despite being down three players, Clemson pounded on Radford, 74-55. San Diego State needed only nine players to upend Cal Poly, 73-56. Tomorrow, #9 Cal is at Northwestern, and #20 Ohio State visits Gonzaga. Interesting match up between two up-and-coming teams with exciting new coaches - each squad of which has been dealing with injuries. Rutgers' two freshmen guards are making a difference. So has the point guard. Oklahoma's leadership needs a hook. Opportunity awaits Iowa State's reserves. TAMU used a strong second half to down USC yesterday, 79-61. My game story. Complete photo gallery, including the image below. Washington State upset #20 Ohio State, 62-55. #14 UCLA took care of Saint Mary's 76-62. Chiney Ogwumike's career-high 31 points powered #1 Stanford past Pacific, 78-43. St. John's beat Tennessee Tech, 58-46. George Washington escaped Howard, 61-60. Wright State squeaked by Xavier, 66-65. Eastern Michigan outlasted UMKC, 74-69. DePaul, Georgetown, Marquette, Providence, St. John's, Seton Hall and Villanova are leaving the Big East. Penn State has learned from tough road tests. Coach Pat Summitt was honored at the Marquette-Toledo game tonight. Son Tyler Summitt is an assistant at Marquette. Clemson has two transfers and a hardship. In the home of Kentucky's Kastine Evans, the less fortunate are never forgotten. In the huddle with Santa Clara assistant Marissa White. Colorado stunned #8 Louisville, 70-66. The Buffs mounted a 12-point lead, and the Cardinals rallied hard in the last few minutes, but were unable to close the deal. Colorado is 9-0. The Buff's Rachel Hargis had seven blocks. The game proved a strong debut for Colorado's Arielle Roberson. As seven schools leave the Big East, one writer says it's a sad day for basketball. Monmouth University will leave the Northeast Conference for the MAAC. Whitney Hand is "OK" with the end of her college career. I hope she has called Jacki Gemelos. Tennessee readies for the toughest stretch of their season. Georgia Tech point guard Sharena Taylor will continue to be the ultimate role model. Ohio State's Amber Stokes follows in her father's footsteps. Texas Tech's rebounding is improving. Practice time is valuable for Missouri. Boston College’s Katie Zenevitch and Nicole Boudreau are enemies that turned roommates. Pittsburgh standout Shalonda Winton is sparkling at Cleveland State. Nicki Jones has spurred Drexel to early success. Wisconsin walk-on Tessa Cichy has found her niche. Division II Art U has some of the best defense in the nation. Sacred Heart is getting into the holiday spirit with community service. Jackie Stiles has a new role as assistant coach at Loyola Marymount University, but the same drive. Jennifer Azzi is rebuilding at U San Francisco. Oklahoma's Whitney Hand prepares for life after basketball. Michigan State freshman Branndais Agee will miss the remainder of the season with a torn ACL. What's going on in Arizona? The annual Nike Tournament of Champions this year features only eight teams per bracket instead of 16. This makes it a three-game road to a championship instead of a four-game challenge. Auburn's victory over George Washington gave Coach Terri Williams-Flournoy her 150th win. Penn State Coach Coquese Washington earned her 100th win as her Lions beat Virginia Tech. For those of you who are like me and are freakin dying from lack of college hoops, take heart: things will be back on and poppin' Saturday. Donna Lopiano will receive NCAA's Ford Award for her leadership and advocacy for college athletics. Notre Dame assistant coach Carol Owens is the president of the Black Coaches Association. Tennessee freshman Andraya Carter had successful surgery on her right shoulder this morning, to repair a labral tear. SLAMonline's Q&A with Elizabeth Williams of Duke. Blue Devil assistant coaches Joy Cheek and Candice M. Jackson have added comfort to the staff. Stunning support for Oklahoma's Whitney Hand. An injury to Wisconsin guard Taylor Wurtz will keep her sidelined. Antonita Slaughter is stepping up for Louisville. Kama Griffitts is an emerging star for Arizona. Columbia College's Jasmine Davis doubles as a standout singer. Maya Moore is averaging 45 points a game this winter playing in China. Lauren Jackson's muscle tear has been identified, and her career won't have to end. Mercury guard Alexis Hornbuckle helped lead a fitness clinic at an Arizona elementary school. Silver Stars Coach Dan Hughes has been doing community service in San Antonio during the off-season. The Sun's Danielle McCray checks in from Italy. New Jersey's Lincoln High knows how much is expected of the reigning Hudson County champs. Recruiting is different for girls. “Flopping” will be defined as any physical act that, upon review, reasonably appears to have been intended to cause the referees to call a foul on another player. Under the new defensive three-second rule, a violation will result in a technical foul being assessed if a defensive player violates the “actively guarding” guidelines. Following the free throw for the technical foul, the offense will maintain possession of the ball at the free throw line extended. Slight changes also have been made with regard to the use of instant replay as it pertains to flagrant fouls and the restricted area. Green Bay, Princeton, San Diego State, Hartford, Quinnipiac. Shenneika Smith of St. John's, Jazmine Redmon of Gonzaga and Malia Magazzeni of New Mexico State explain how. #19 North Carolina bested North Carolina Central, 49-21. It was the lowest-scoring game in Tar Heel history, and the game tied the school record for fewest points in a win and for fewest points allowed. The legendary Tennessee coach has been named the Naismith Outstanding Contributor to Women's College Basketball. Oklahoma State sophomore guard Jordan Schultz has left the program for personal reasons. North Texas senior Jasmine Godbolt has been dismissed from the team. Emiah Bingley is leaving Iowa State. Three former Auburn greats will be inducted into the 2013 Alabama Sports Hall of Fame. Auburn Coach Terri Williams-Flournoy is one win away from a milestone. Florida's Sydney Moss is stepping toward success. Nebraska Coach Connie Yori celebrated the placement of the final steel beam in the Huskers new arena, which will open next fall. Aye Chihuahuas! Old Dominion's point guard relish their nicknames. Vanderbilt's Melanie Balcomb was born to coach. Kim Austin Mbadinga-Nzamba returns to Colorado State - as a coach. Adrian Ritchie is soaring with Wisconsin-Green Bay. Marist and Boston University have forged a rivalry. Longwood University's Chelsea Coward has a sense of security. The Iowa Hawkeye team includes several Minnesota natives. Rutgers is showing signs of return. Maine Coach Richard Barron is hoping leaders emerge on his young team. Why one writer will always be grateful for Oklahoma assistant coach Chad Thrailkill. Ladyswish has some thoughts on growing the game. Controversial lopsided victory in Indiana......Bloomington South High School beat Arlington High School 107-2 last night. Wonder why no one stopped that game. That's inexcusable. The University of Portland welcomes prized Alaska recruit Hannah Mattson. Meet the class of 2013: Baylor signee Nina Davis. New Jersey's Blair Academy is poised to have another great season. "Go big" is the mantra for Washington state's Bethany Montgomery. Lehigh (New Jersey) Valley's Amina Affani's path to becoming a basketball player. Ruth Riley talks about her recent community service in Africa. USA Basketball lead to friendships and gold medals for Chiney Ogwumike. ESPN 980 has suspended two radio show hosts for their rants against a transgender basketball player. Andraya Carter's troublesome right shoulder didn't leave her with much of a choice. After suffering injuries to the shoulder in three of Tennessee's last four women's basketball games, the Lady Vols freshman point guard consulted with her family and decided to undergo surgery. She will have the shoulder repaired this morning and miss the rest of the season. "She could still play this year with the hope that (the shoulder) didn't go out," Warlick said on Wednesday, "but it came out twice in two games fairly easily. So it was their decision that if she could get a redshirt year, or a hardship year that they would do that." UT will apply for a medical hardship for Carter, who first suffered an injury to the shoulder during her senior season at Buford (Ga.) High School. Warlick said that Carter is under the limit in terms of games played this season. #10 Maryland routed Towson, 88-43. #18 Texas thumped Louisiana-Monroe, 77-49. Beth Mowins and Debbie Antonelli discuss the (still) undefeated teams, and talk with Maryland Coach Brenda Frese. Tyler Summitt has taken the family legacy to Marquette. Where is Kentucky's A'Dia Mathies? Michigan State guard Kiana Johnson and forward Akyah Taylor will return from suspension Sunday, in time to play IPFW. Amber Moore leads Illinois on and off the court. Maggie Lucas blogs about working with her basketball position coach. She is the USBWA player of the week. DeNesha Stallworth gives Kentucky a boost. Rebecca Lobo has five questions for Baylor point guard Odyssey Sims. Oh my, there's another one: Texas sophomore forward Nneka Enemkpali is the first player in school history to post six consecutive double-doubles. In doing so, she broke Tiffany Jackson's 2006 record. Injuries are threatening Oklahoma's season. Colorado redshirt freshman Arielle Roberson is making a solid first impression. UCLA's Alyssia Brewer's got it for the Pac-12. The SEC honor goes to DeNesha Stallworth of Kentucky. Elizabeth Williams is tops in the ACC for Duke. Maggie Lucas is it in the Big Ten, for big Penn State. For C-USA, it's Whitney Bibbins of Tulane. The A-10 top player is Becca Wann of Richmond. Cleveland State's Shalonda Winton is it for the Horizon League. It's the second week in a row for Central Michigan's Crystal Bradford, in the Mid-American Conference West. IUPUI's Kerah Nelson takes it for the Summit League. Next spring, the WNBA draft will air live in primetime for the first time. Maybe #10 Penn State was still hot over Thursday's loss to UConn? They pounded Georgetown, 97-74, behind Maggie Lucas' 39 points. #4 Duke's Elizabeth Williams is recovering from injury, but you wouldn't know it today. She lead the Blue Devils over St. John's at the Maggie Dixon Classic, 60-42. Williams had 16 points, seven rebounds and five blocks. #15 Purdue escaped Tennessee-Martin, 68-60. Tulane rallied to beat LSU in overtime, 66-64. It looks like Nikki Caldwell's mojo at UCLA is taking a bit longer to develop in Louisiana. Also at the Dixon Classic, Rutgers squashed Louisiana Tech, 73-46. Arizona climbed out of the mediocrity bowl to upend Boston College, 68-59. Lauren Carra knocked down a jumper with two seconds to go to lift Delaware over Princeton, 59-58. South Carolina's 69-35 win over Furman makes them 10-0. They have tied the school record for wins to open the season. Santa Clara beat Long Beach State at the buzzer, 68-67. Cal State Bakersfield grabbed one, over UC Irvine, 71-64. The head coach of CSUB is Greg McCall, whose daughters are DeWanna Bonner and Erica McCall. Gonzaga slapped Cal State Fullerton, 83-44. BYU's Haley Steed is ESPNW's player of the week. At the Maggie Dixon Classic, new Liberty Coach Bill Laimbeer paused for an interview. Georgia Tech Coach MaChelle Joseph is patient as her team comes together. It's finals week at colleges across the U.S., and this week's game schedule is next to nothing. But things will be back on and poppin' this Saturday (I will be attending back-to-back games, myself). Kentucky's summer drills included lessons in sacrifice. At Tennessee, Stokely Athletics Center is closing, and Coach Holly Warlick has a gang of memories there. The Lady Vols' "live pink, bleed orange" game will be Feb. 17, against Vanderbilt. Oregon and Oregon State are trying to rebound from injuries. Missouri has turned into an offensive machine. Wyoming's Chaundra Sewell takes pride in cleaning the glass. Vote for Tamika Catchings in Hall of Game Awards. A glimpse at tomorrow's stars in Skylar Diggins, Brittney Griner and Elena Delle Donne. Upset of the day? #17 UCLA upended #12 Texas, 62-42. 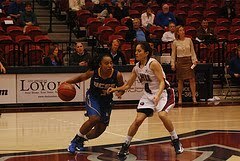 Alyssia Brewer lead the Bruins with 12 points and 11 rebounds. Game picture of Brewer. Jordan Hooper lead #25 Nebraska to a 78-77 win over #24 Florida State. She had a career-high 36 points and 12 rebounds. #19 Dayton handed Michigan State their first loss, with a 60-53 win. San Diego State rallied to beat San Diego on their home court, 58-54. Wake Forest held on for the 64-63 victory over Seton Hall. Duquesne's Vanessa Abel was granted a sixth year of eligibility by the NCAA, and played today in their 70-61 defeat of Pitt. Clutch shooting sent North Dakota past Drake in overtime, 67-63. Arizona held off New Mexico, 58-53. At Tennessee, taking shots is an issue for Taber Spani and Cierra Burdick. Mater Dei whooped Troy last night, 61-25. There to watch was UConn Coach Geno Auriemma, University of Washington Coach Kevin McGuff, and coaches from the University of Oregon, University of San Francisco, Cal State Fullerton and Missouri State. They were likely there to watch Katie Lou and Karlie Samuelson of MD, who have been leading the Monarchs so far this season. Absent was Khalia Lark, who is rumored to have quit the Mater Dei team. While the win is impressive for the Monarchs, it also speaks to the fact that they are the lone big cheese in Orange County basketball anymore. Troy used to be a power, as did Brea Olinda, who had been nationally ranked for years with Mater Dei before Coach Jeff Sink left last year. Sink, who coached the Ladycats for almost two decades, inspired cheers from the student section during games. It seems that with his fire, so has the the program gone. It makes me sad, as rivalries make the game great. Hopefully someone in California's Southern Section can rise up to challenge Mater Dei sometime soon. Kentucky demolished DePaul, and set a new attendance record. Over 18,000 fans packed the house for the game. As a strength and conditioning coach, I love this: players fear the workout. The best friendship of George Washington's Tara Booker and Sara Mostafa goes way, way, way back. Without Elena Delle Donne for many games, Delaware is regrouping. Notre Dame Coach Muffet expects the bench points to come eventually. UConn, heading into finals break, has work to do. Michigan adjusts its starting lineup. Missouri players challenge themselves in the classroom. Colorado is building their resume for a top 25 spot. Weight can be a touchy subject for female athletes. MRI has confirmed ACL tear in Whitney Hand's left knee. Arkansas handed #17 Kansas their first loss of the season with a 64-56 victory. #22 Iowa State also sustained their first loss, to Iowa, 50-42. Crazy thing was, the Hawkeyes had been up by much more. #10 Penn State made it a game with #2 UConn most of the way, but like Notre Dame last night, they ran out of gas. Final: Huskies 67, Lions 52. #13 Oklahoma's Whitney Hand went down with a knee injury early in the game, but the Sooners still managed to slip past North Texas, 71-68. #16 Oklahoma State continues their undefeated ways, besting Stephen F. Austin, 85-41. #4 Duke, also loss-less, hammered Georgia Tech, 85-52. #9 Maryland slammed Virginia, 79-55. #15 Purdue survived IFPW, 69-54. Tomorrow is that big DePaul at Kentucky game......it's sold out, and will be loud. Odyssey Sims ignited the Bears past the Irish. Baylor was too tall of a task for Notre Dame. The ACC says rumors of more defections are "totally false." What's in a conference name? Increasingly less. The media states the obvious: women's basketball deserves more exposure. BYU's leader scorer, Lexi Eaton, has torn her ACL and will miss the remainder of the season. Lady Vol report: getting focused. Pat Summitt has received an AARP award. UConn Coach Geno Auriemma has been granted an extension on responding to the sexual harassment lawsuit filed against him. Husky freshman Breanna Stewart is progressing nicely. Old Dominion Coach Karen Barefoot says defense first. Maryland is facing a rigorous 18-game ACC schedule, starting tonight. Utah is out to prove themselves. Rutgers' youth and lack of perimeter shooting has made for a rough start to the season. But Coach C. Vivian Stringer isn't stressed about it. Wisconsin's Morgan Paige has turned up production on both ends of the floor. North Texas freshman Alexis Hyder is adding substance to her game. Sooner report: turning the tables. Lynx Coach Cheryl Reeve has signed a multi-year contract extension. The terms weren't disclosed. WNBA around the world: five things to know. UC Santa Barbara beat Loyola Marymount at home last night, 79-69. It was the Lions' first home loss. Check out Gregory Major's fine photo gallery of the close match up, which includes the pictures below. Nicole Nesbit tries to get around Hazel Ramirez. Alex Cowling puts up a shot over UCSB defenders. It was a close game most of the way, but Notre Dame ran out of gas and Baylor won the championship rematch, 73-61. Brittney Griner lead the Bears with 24 points and 14 rebounds. Also tonight, Creighton upset #25 Nebraska, 66-57. The Western Athletic Conference adds Chicago State, and keeps their tournament hopes alive. Chelsea Gray and Elizabeth Williams keep Duke flying high. Kentucky is set to break their school attendance record Friday with their game against DePaul. Marist has signed Coach Brian Giorgis to a contract extension that runs through 2021. Tennessee's Ariel "Mama" Massengale is in a familiar role. The Duke Blue Devils had a locker room and lounge-naming ceremony. UConn's Kaleena Mosqueda-Lewis is questionable for tomorrow's game against Penn State. Penn is in search of a traveling groove. Cornell, Harvard and Princeton are emerging as title frontrunners in the Ivy League. FGCU is not about to over-use "team engine" Brittany Kennedy. Colorado's Jen Reese has found her niche coming off the bench. Georgia State's Cody Paulk is a shot-blocking monster. ODU: five thoughts from Cal and Dartmouth last weekend. Dartmouth's Abbey Schmitt has returned to the hardwood in a big way. Temeka Johnson blogs from Europe - in the holiday spirit. Who should coach the Connecticut Sun? Elena Delle Donne, Brittney Griner and Skylar Diggins have found success in their own backyards/comfort zones. They are three to see. Learning life as a Lady Vol. "Tenn questions" for freshman Bashaara Graves. Bright lights for lone UConn recruit Saniya Chong. Rutgers is suing the Big East over their exit fee, and the wait time. It's a rematch of last year's NCAA title game between Notre Dame and Baylor, and the Bears are the favorites. LaChina Robinson previews the game. Beth Mowins and Debbie Antonelli podcast. On Thursday, Penn State will be at Connecticut, which will pit former high school teammates Maggie Lucas and Caroline Doty against one another. Lucas blogs about it. Elena Delle Donne talks about the WNBA and her Olympic future. The Texas A&M women's basketball team lost half its returning starters from last season's NCAA Tournament Sweet 16 team when sophomore point guard Alexia Standish quit the team Monday. "She's just lost the passion for the game," A&M head coach Gary Blair said. "I hate to see it because of all the hard work she had to put in it because of the knee surgery." Check out the photo gallery from yesterday's game, courtesy of my friend Kim Hersh, who was lucky enough to be there. The photo below is included. 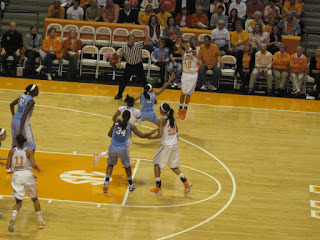 The Lady Vols beat the Tar Heels 101-57. ESPNW player of the week Meighan Simmons has hops.